Last week, Egyptian-born American preacher Ammar Shahin delivered a Friday sermon at the Islamic Center of Davis, northern California, where he serves as Imam MEMRI reported. In it he cited a hadith, according to which the Muslims would fight the Jews on Judgment Day, and prayed to Allah to “liberate the Al-Aqsa Mosque from the filth of the Jews” and to “annihilate them down to the very last one,” not sparing any of them. “Oh Allah, make this happen by our hands. Let us play a part in this,” he prayed in the sermon, which was posted on the Davis Masjid YouTube channel. Imam Shahin, who had earned a B.A. in Islamic studies in Egypt, traveled in 1999 to the U.S., where he obtained a degree in computer engineering. He is listed as an instructor of the Zidni Islamic Institute, a California-based organization that teaches Sunni Islam in the West. Sheikh Ammar Shahin: “Allah does not change the situation of people ‘until they change their own situation.’ The Prophet Muhammad said: ‘Judgment Day will not come until the Muslims fight the Jews, and the Jews hide behind stones and trees, and the stones and the trees say: Oh Muslim, oh servant of Allah…’ They will not say: Oh Egyptian, oh Palestinian, oh Jordanian, oh Syrian, oh Afghan, oh Pakistani. The Prophet Muhammad says that the time will come, the Last Hour will not take place until the Muslims fight the Jews. “We don’t say if it is in Palestine or another place. Until they fight… When that war breaks out, they will run and hide behind every rock, and house, and wall, and trees. The house, the wall, and the tress will call upon the Muslims. It will say: Oh Muslim… It will not say: Oh Palestinian, oh Egyptian, oh Syrian, oh Afghan, oh Pakistani, oh Indian… No, it will say: Oh Muslim. Muslim. When Muslims come back… ‘Come, there is someone behind me – except for the Gharqad tree, which is the tree of the Jews. Except for a certain tree that they are growing today in Palestine, in that area, except this form of tree, which they are growing today… That’s the tree that will not speak to the Muslims. “Oh Allah, support the Al-Aqsa Mosque and the rest of the Muslim lands. Oh Allah, liberate the Al-Aqsa Mosque from the filth of the Jews. 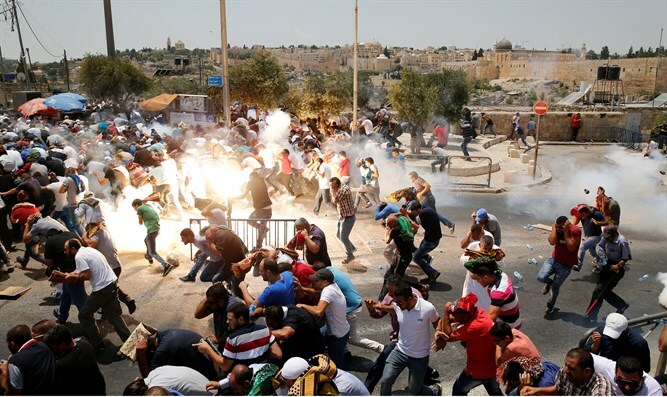 Oh Allah, destroy those who closed the Al-Aqsa Mosque. Oh Allah, show us the black day that You inflict upon them, and the wonders of Your ability. Oh Allah, count them one by one and annihilate them down to the very last one. Do not spare any of them.